Enemy Engaged – Comanche vs. Hokum (EECH) is a combined forces realtime battlefield helicopter simulation. The player pilots an attack helicopter inside a dynamic campaign. Instead of being confined to separate pre-defined "missions" like in so many other simulation games, it is possible to see the battle unfold across the entire battlefield in real time, without "load times" during missions. Your tasks in the game range from attack missions on enemy bases, FARPs and vehicles, close air support or interdiction of enemy air defenses, recon-missions to obtain photographic intelligence, down to simple transfer missions to replenish your forces. 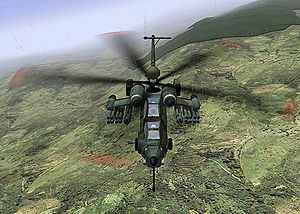 Effective air defense simulations necessitate NOE (Nap of the Earth) flying and the use of terrain as cover, as well as making best use of the stealth characteristics of the Comanche helicopter. A "Mission Commander" feature allows players to define their own missions and ultimately control the battle strategy from a powerful interactive game map that integrates seamlessly with the 3D action. The entire battlefield simulation is fully networked and supports multiple human pilots on either side of the simulated conflict. 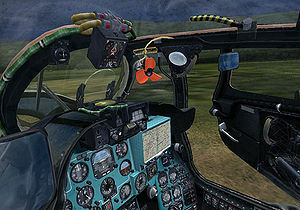 The game tries to be as realistic as possible, having features like the realistic engine startup procedure and the priority fire zones for example, while retaining the ease-of-use factor that makes it popular with players who are more interested in action than avionics. Support for innovative input devices like TrackIR allow for an optimal level of immersion. Combined with the truly massive environments that retain a realistic sense of scale. Although the original game was released in 1999, the community has developed substantial graphics and gameplay-related enhancements, aside from stability and multiplayer improvements. The release of the game's source code ensured that an active fan community grew in size, turning EECH into it's current game. You can have a look at some screenshots of the game in the gallery. This page was last modified on 11 October 2017, at 14:43.